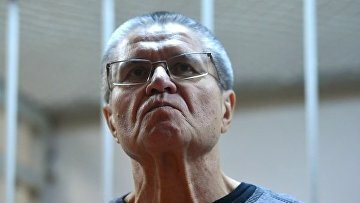 Seizure of ex-minister Ulyukayev’s money accounts lifted | Russian Legal Information Agency (RAPSI). MOSCOW, October 31 (RAPSI) – Moscow’s Zamoskvoretsky District Court on Wednesday held that the seizure of monetary assets belonging to ex-economy minister Alexey Ulyukayev sentenced to 8 years in prison for corruption could be lifted, RAPSI reported from the courtroom. The court therefore granted a motion filed by the Federal Bailiffs Service, which was also supported by the convict’s defense. Bailiffs would thus be able to collect a fine imposed on Ulyulayev as part of his sentence. The former minister’s property was seized further to two court decisions issued in November 2016 and January 2017. On June 4, the convict was transferred to a prison.